Depending on the application you are using your Fadal machine for, such as mold making, the available memory can be too small to contain the full machining program. In cases such as this, the program is stored on a separate computer and sent directly to the machine, one data block at a time. This is sometimes referred to as “drip feeding” a program to your CNC machine. 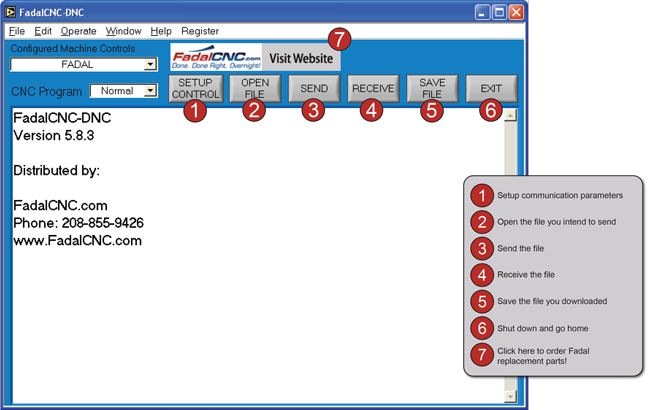 FadalCNC-DNC software is a low cost, easy to use, serial RS232 DNC software program that has been specifically designed for communicating with a variety of Fadal CNC machine tools. Our DNC product is designed to be simple to install, use, teach, and maintain. We've made it so easy! This software is to be installed on one computer that it will remain on for the duration of its lifespan. The software license is physically tied to the hardware of the computer that it is installed on. ** PLEASE NOTE: As with all DNC software, if your pc is old and has little memory (RAM) available, it is recommended that you disable the screensaver as well as the power saving options. Need help setting up your shop for RS232 communication? We have tech tips for that as well! Looking for something more robust with additional features? Check out our Quick Serve software today.